Beat This Caption Contest 86 Winner – Caption Contest Funny Clever Witty Enter Today! The uncensored version of My Strange Addiction: My Car is my Lover! 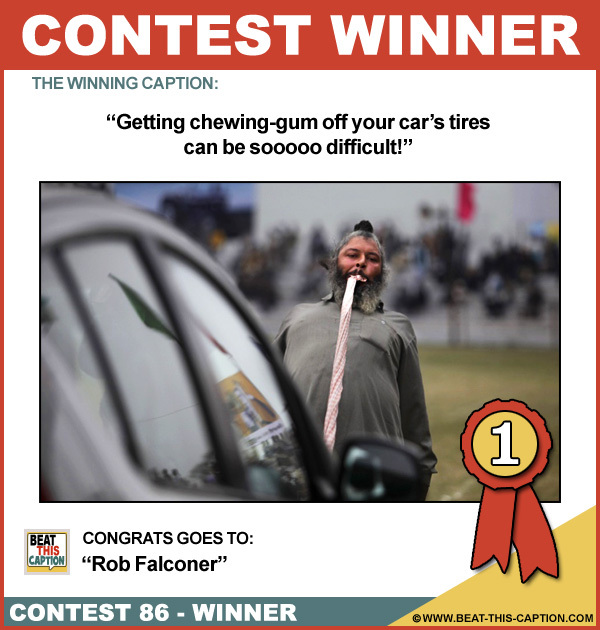 Getting chewing-gum off your car’s tires can be sooooo difficult! I do that with Gum on my Shoe! YUM! Great stuff! You WIN nothing! Raajy would soon come down with car-pull tunnel syndrome! Salt Water Taffy goes a long way these days! If your car is your lover, isn’t there a more sanitary way of removing the tampon? They always seem to run right towards the headlights, don’t they? You can also find the towing capacity in the owner’s manual! Extreme ways to pull a tooth! Look what was in my exhaust! At last, the Indian prince found a date! Ripley’s first picture of the Mumbai Windowlicker! Still getting his kicks on route 66!